Building on their Sigma design, Sontronics' Delta is more rugged, and voiced with guitar cabs in mind. 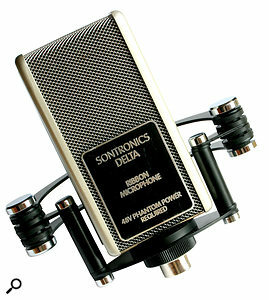 In recent years, Sontronics have become an increasingly respected name in the crowded mid‑priced microphone market. Their Sigma active ribbon mic (reviewed in May 2007: /sos/may07/articles/sontronicssigma.htm) has been widely praised for its natural character and warm, vintage sound reproduction, and they've continued what they started with another active ribbon, the Delta. So what do we know about this microphone? Well, Sontronics tell us on their web site that "Where the Sigma has found its place in the heart of the studio and recording world, the Delta's incredible capability in miking guitar cabinets sets it up to become a new standard in live sound reinforcement.” Fair enough, but we wanted to see how it behaved in the studio — and in particular how it sounded on electric guitars in that environment. This mic makes a good first impression. It comes in a reasonably robust aluminium case, which provides ample protection for everyday storage and transport. You wouldn't want to let airport baggage handlers get at it, but that's fair to say of all factory‑supplied cases in this price bracket (and in fact almost all at any price). The mic and its shockmount nestle in the sort of soft velvety stuff that you'd expect the crown jewels or Paris Hilton's dog to sit on — and this is appropriate, because while it's not as astronomically priced as either of those, it looks expensive and stylish, with an air of vintage quality about it. Over the sessions I've used it on, it has regularly attracted attention from clients for its good looks. I found the microphone physically very easy to work with. The shockmount is solid and well built. It attaches easily and can be done without having to remove the mount from the stand. Another big plus is that it doesn't rely on a spaghetti of complicated elastic stretchy things: you're not going to spend half your day trying to put it back together without it hanging at a funny angle. The combined weight is surprisingly light — but without feeling cheap — and I never felt that it would get the better of its angle adjustment and start to sag. Equally, because the mic screws into the mount, you can happily rig it upside down without worrying that it's going to escape suddenly and kill the drummer. The whole assembly is quite wide, but it's not deep, and the shockmount sits sufficiently below the level of the ribbon itself to allow you to line another mic up right alongside if you need to. I didn't have any problems positioning it in relation to its size but it did strike me that the width, in combination with the gleaming polished metal of the mic's body might make it obtrusive in a televised live situation — although that's not a concern in the context of this review. Before we move on, there are a couple of practical issues common to almost all ribbons which are worth mentioning. First, putting a ribbon in front a screaming 4x12 day after day, or night after night for that matter, does raise the question of life expectancy. Sontronics state that the mic can handle 135dB SPL, which is impressive, but ribbons are fragile, and when you go too far with them, they break. This is not a criticism of this microphone, but the nature of the beast, and while the mic is designed for use on guitar amps it doesn't mean that you don't need to be careful with it. It's important never to allow blasts of air to reach the ribbon, and the use of a pop filter of some sort is a sensible precaution in many situations. Secondly, most ribbons, including this one, are bi‑directional: they capture sound equally from the front and, with reversed polarity, the back. On the plus side, this polar pattern gives us a very deep null at the sides, which can be used to almost completely exclude unwanted spill (provided there's sufficient flexibility to position things where we want), but on the minus side, you do have to pay attention to where the rear of the mic is pointing. In a large room you may find yourself collecting some ambience for better or for worse, and in a small room, it's easy to pick up some unwanted room coloration. In order to get a clear picture of how the Delta performs on guitar amps, fellow engineer Dan Goudie and I decided to take a different approach from the usual SOS review, and made a number of test recordings in direct comparison to two ubiquitous studio mics: the Shure SM57 and the AKG C414B ULS. The idea was to compare it with some very commonly used dynamic and condenser models, to give you some sort of identifiable reference sound, so we've placed the resulting sound files on the SOS web site at /sos/apr10/articles/sontronicsdeltaaudio.htm. The guitars were recorded via an A‑Designs REDDI valve DI box straight to Pro Tools via a mic amp and converter in my Cranesong Spider. From there, they were re-amped to the relevant amp, and recorded with each of the mics in turn, again using the Cranesong, and there was no compression or EQ applied. In order to protect the ribbon element from any excessive SPL that may be encountered, an A‑Designs Blast Pad filter was used, because it's an extremely transparent device that provides protection without any loss of high frequencies. For the purpose of comparison, we left it in place for all the mics used, and it served the additional purpose of providing a clear reference point in terms of mic position. We made an effort to ensure that not only were the mics placed in the same position as far as reasonably possible, but that the levels were similar. Obviously, the differences in the way these types of microphones respond to transients lead to differences between average and peak levels. For example, the slower‑moving diaphragm in the SM57 acts rather like a compressor, making for a more even level, and thereby making it difficult to exactly level-match the files. Rather than get embroiled in some sort of scientific comparison, we just used dead reckoning to match levels as closely as possible in the time we had available, so it might be useful to play with the levels of the files a little when listening to them. What we aim to show here is the broad differences in character between these 'known' microphones, and the Delta. In a real‑world scenario, we'd have searched for positions for each of the mics that were better suited to them individually — but clearly that would make an assessment of their relative character impossible. 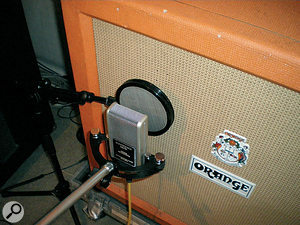 The files consist of three main recordings: a distorted sound using a Gibson Les Paul Junior into a Soldano Hot Rod 50+ amp with an Orange 4x12 cabinet; a fairly percussive clean sound using a Fender Telecaster into a Vox AC30; and a gentler, finger‑picked clean sound using the same Telecaster into an Orange AD30, with the same Orange 4x12 cabinet. In each of these cases we placed the mics close — around 10 centimetres from the best‑sounding speaker in each of the cabinets — and put the Blast Pad in between. We recorded four passes of the DI, one for each of the SM57, the 414, the front of the Delta and the back of the Delta. Being an active ribbon, the Delta has a much higher output than a classic ribbon design, or a dynamic mic. In fact, its output is similar to that of a condenser. Considering that you can't pad it in the same way as you can the C414 for example, this can cause you problems. We weren't running the Soldano particularly loud (a medium gigging level, I'd say) but we found ourselves down around the lower levels on our mic amp. While that's fine with the Cranesong, it wasn't so easy with my API preamps, which are rather hotter. I love APIs on guitar amps, but I find that the use of the built-in 20dB pad compromises the sound. I therefore prefer to rely on a less sensitive microphone, or one with a pad. Even with the preamp gain fully counter‑clockwise, I was constantly overloading the preamp. An in‑line pad would solve this issue, but it's worth being aware of it. 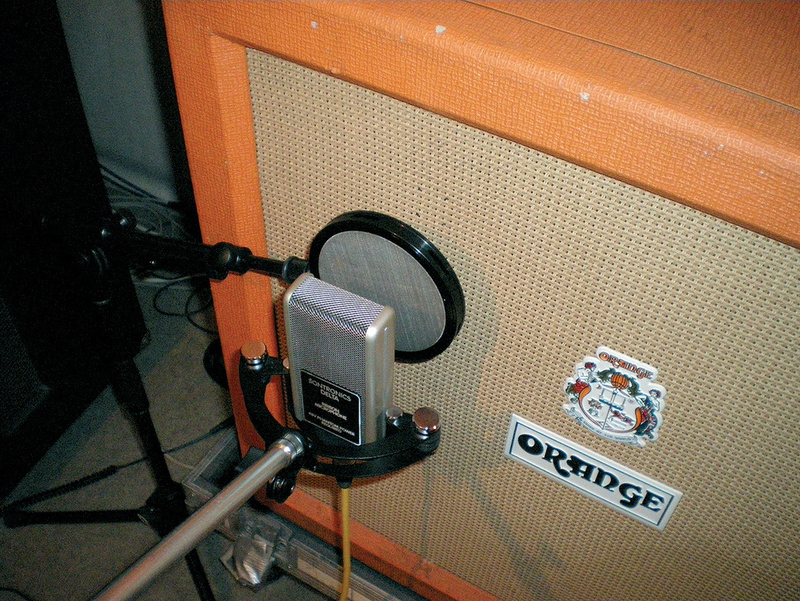 After all, the mic is marketed as being ideal for guitar amps in a live situation, where they're always going to be loud. One of the first things I noticed was that even placed close to the speaker, as we were, there was no obvious hum, which is often a problem with ribbons when used very close to an amp. 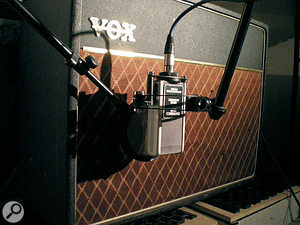 There was also no excessive proximity effect: sometimes ribbon mics can be overly subject to this increased low‑end response as you get close to the source. The Delta was big and warm, as you'd expect, but not boomy or out of control. I found the balance to be very well judged in this respect. Listening to the recorded files, a few things strike me about the mic. On the clean sounds, it's beautifully warm at the bottom end and smooth at the top: it's everything that you expect a ribbon to be from that point of view. It seems to handle the transients with a silk glove. It's inviting, homely and warm, and has the natural reproduction that is the hallmark of this type of microphone, and while it could never be described as bright, it's not dull either. As with other ribbon mics, it takes EQ well. For instance, you can wind some top end in without highlighting the zingy resonances that characterise some condensers. These factors are its blessing, and its party trick — but they're also its curse, because sometimes you don't want rich, warm, encompassing lows and silky‑smooth highs. Sometimes we want the sort of bite that a 414 gives us, and sometimes the contained fizz of a 57. We're governed from time to time by what we expect, and by what fits into our mix. For me personally, I found myself favouring the Delta on the gentler clean sounds, but the C414 on the distorted high‑gain Soldano — but then the beauty of what we do is that everyone is different, and I'm sure others may feel the exact opposite. I'd think that anyone going for a more classic rock sound would find the Delta to deliver admirably. While the Delta is warm in low end, it's not cluttered by excessive amounts of very low frequencies, and I noticed that the 414 was picking up more deep bass stuff that, when mixing, I would most likely filter out. A look at the frequency‑response graph confirmed that the response begins to roll off below about 60Hz. The audio files also show that the mic exhibits a subtle difference in character between the front and the back. It's a little darker at the back, and somehow I found myself consistently preferring the front of the mic — although I didn't feel that it was so different that it allowed me to achieve a usefully alternative character by reversing it, as happens with some ribbon mics. Moving away from the specific application of guitar amps, I took the mic with me on a session and experimented with it as a room mic in a large room — and I found that it really shone in this application. I love the fact that you can point the deep null of the figure‑of‑eight at the source, and record purely reflected sound. As you might expect, the mic sounded natural and smooth. I've included a couple of files from the session, with the kind permission of the artist, Damian West: I used it as a room mic on both guitar amp and Hammond organ. Putting the Delta up on acoustic guitar delivered more of that now-familiar character: rounded, smooth top end, and warm lows. I found it just a little too warm for my tastes, preferring a bit more edge. In comparison with an electric, acoustic guitar produces more frequencies above 5kHz, by which time the Delta is dropping off a fair bit. However, I can imagine instruments and styles with which it would work well. Finally, I had the opportunity to try the mic on male vocals, in both softly intimate and loud rock styles. Without EQ, there was too little definition in the top end for it to deliver a contemporary sound, but this is true of most ribbons, and some dynamics too. Adding some high‑shelf boost brought the vocal to life. As with the guitars, I found that the louder vocal passages had me reaching for some method of padding the mic due its sensitivity. I'm not sure that I'd find much use for the Delta as a vocal mic, personally, but, as with the acoustic guitars, someone going for a more vintage sort of vibe might well get more use out of it in that application. Ribbon mics aren't like condensers or 'conventional' dynamics. They're a little more fragile, but if you treat them right they can reward you with great beauty. The Delta is no exception. Would I buy this if I needed one mic only for recording guitars? Not unless my only application was big warm clean sounds — in which case I would put it on the shortlist. Would I be happy to have it as an option? Absolutely. I didn't have the chance to compare it to some of its more expensive competition, but I have a feeling it will hold its own. Ribbon microphones have enjoyed a resurgence in recent years, so there are plenty of alternatives to try out, many of which featured in our round‑up of ribbon mics in SOS November and December 2007 . Good on clean guitar-amp sounds. Surprisingly good as a room mic. High output levels and lack of pad. 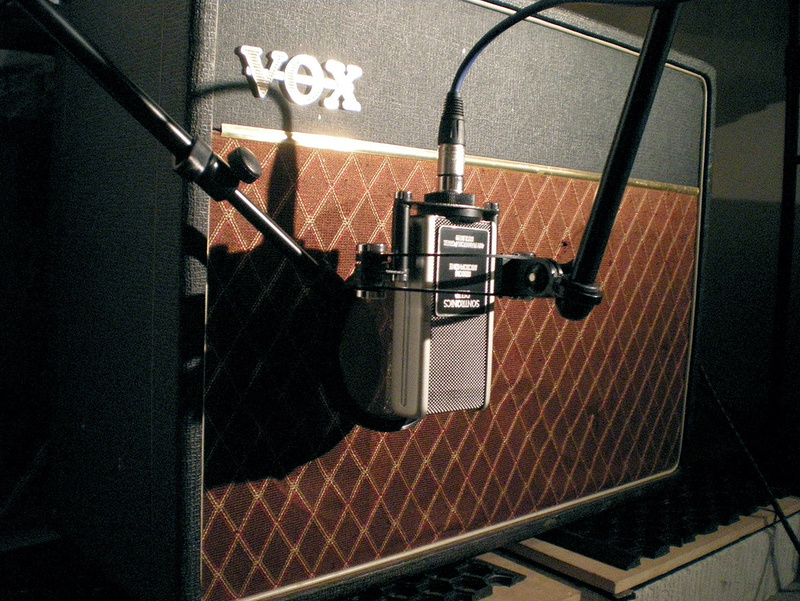 This mic's strength is on smooth, vintage sounds, and it does rather well on clean guitar‑amp tones, as well as turning in a decent performance a room mic. I wouldn't choose it as my only guitar mic, but it's a nice alternative flavour. Company +1 608 227 2040.